There have been few new posts on my blog recently. But there is a very good reason for this apparent laziness, since I’m now writing a book about stone. Or, to be more correct, a book about the cultural history of stone and quarries that led to the building of Europe’s northernmost medieval cathedral, Nidaros Cathedral in Trondheim, Norway. 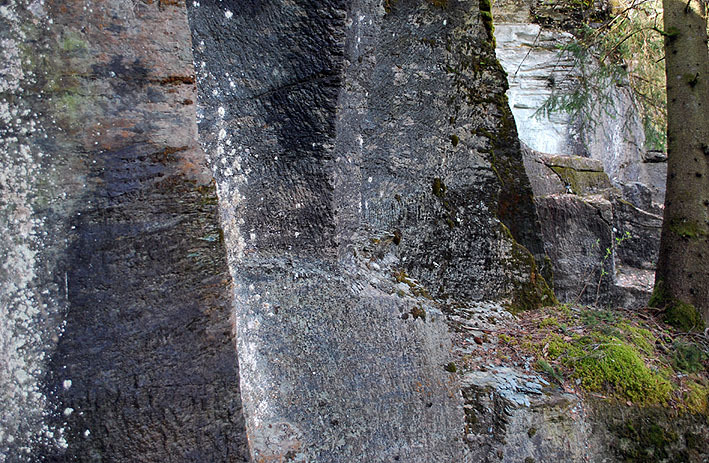 The first half of the book is dedicated to stone and quarries far from Central Norway. The tour starts where the European architectural heritage in stone has some of its key origins; in the Near East, Ancient Egypt and Greek and Roman Antiquity. An exciting trip (at least for the author!) through the grand quarries and monuments of medieval Europe follows, before heading for Scandinavia via the British Isles. For it was from England (and Normandy) that the direct architectural (and technical) impulses came – when the forerunner of today’s Nidaros Cathedral was being built in the late 11th century. With the main building period between the 12th and 14th century, the cathedral was also part of the great, European restoration waves between the 18th and 20th century, implying that what we can admire today is a mixture of medieval and modern (Neo-Gothic) architecture. Researching for the book has been an eye-opener. An eye-opener in terms of the continuity – or very long histories – of quarries that were used to build the grand monuments of the past, including the Trondheim cathedral. For, it may seem, a great number of quarries used to build and decorate the European cathedrals had already been used by the Romans and often their predecessors. Some quarries thus have hugely intricate histories all the way back to the Bronze Age; like Purbeck in Dorset, where it was not the famous marble, but Kimmeridge shale that was first being exploited as early as the Bronze Age – not for monuments, but for ornaments like bracelets. There is yet no hard, archaeological evidence for a similar continuity at the quarries that were used to raise Nidaros Cathedral. But there are loads of indications that several of the ten main quarries used in the Middle Ages may reach back to the Early Iron Age and even beyond. And remember: this was in a country with meagre traditions for stone architecture before the 11th century. Also it was situated well beyond the Roman limes. Thus, the regional soapstone, chlorite schist, marble, slate and sandstone quarries must have been used for other purposes than material for walls and sculpture before the medieval building boom commenced. Good stone doesn’t change its location. (Except in geological terms of continental drift!) What was useful for Bronze Age or Iron Age Man could also successfully be exploited in the Middle Ages. It may not only have been the technical qualities of the stone that were considered “good”, like colour, hardness (or softness), workability, durability, availability, transport issues and so on, but also that the places of quarrying themselves, over time, became imbued with meaning – a meaning that was passed on through generations, centuries, millennia. Some quarries became “central places”. 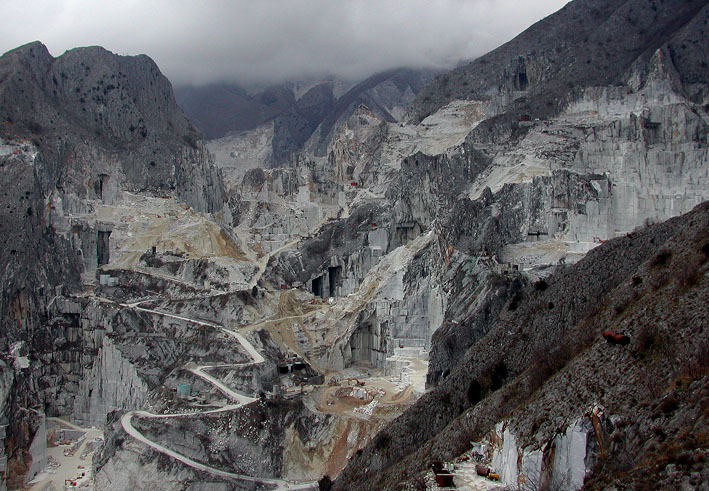 Carrara in Tuscany, with its 3000 year-old history from at least Etruscan times, is such a place. There are many more in the Mediterranean and Europe – and perhaps there are miniature versions of such quarries also in the Trondheim region, used to build Nidaros Cathedral and other stone buildings in the Middle Ages? Quarries, the main resource for building the grand medieval cathedrals, may sometimes be looked at in a similar way as the religious buildings themselves. For the cathedrals were rarely erected at pristine spots. They were built at places with numerous forerunners, be it temples, simple chapels or offering places used in the distant, pagan past. So, in writing my popular scientific book, a great challenge is to argue for continuity at the right quarries, albeit the missing, hard evidence. 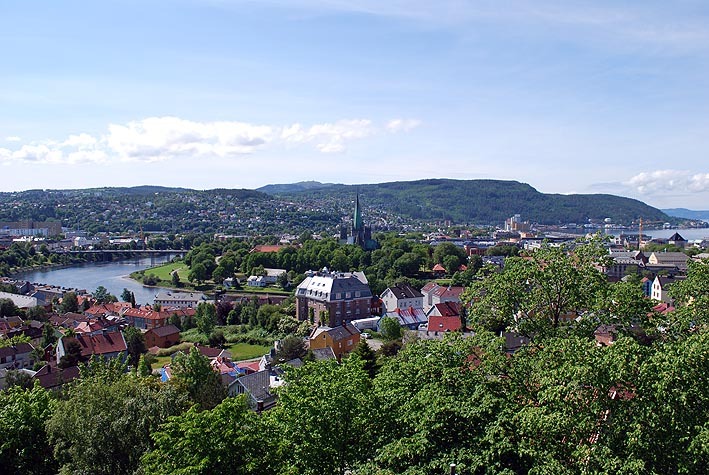 And, at the other end of the scale, taking into account that some quarries must have been opened for the building of the Trondheim cathedral only, perhaps following careful exploration of the regional resources – in a way that may have resembled the way the Roman army proceeded when conquering Europe and the Mediterranean area. They needed vast amounts of stone; surely not all of their quarries had a history way back when. Anyway, I have to get back to writing and arguing – for a book that will be published in Norwegian in 2013… But there will be something for English readers, as well – in the book and on the web. Stay tuned! This entry was posted in Archaeology, New projects, Norway, Old quarries and tagged european cathedrals, marble, Nidaros Cathedral, Nidarosdomen, Norway, quarry, soapstone, trondheim norway. Bookmark the permalink.